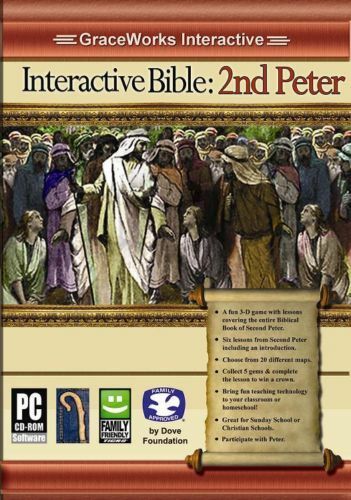 Interactive Bible: 1 Peter is a fun, non-violent 3D game with 11 lessons covering the entire Book of First Peter which offers great lessons including topics Hope in Eternal Life, Call to Holy Living, Husbands and Wives, and Suffering for Being a Christian and more. There are 20 different maps to choose from so hours and hours of game play. The player collects keys, gems and power-up stars while testing the truth of pitfalls while answering questions based on the lesson at hand.